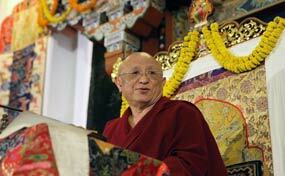 Chokyi Nyima Rinpoche gave Phowa teachings in Nubri. Just after two days everybody showed the sign! Wonderful news for all TTE practitioners who have already completed the Third Excellence part 1—the contemplations on the Inner Tara Sadhana will be launched on Dakini Day, April 29! 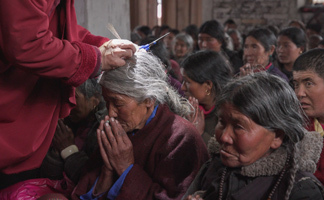 Phowa Teachings and Longevity Empowerment with Chokyi Nyima Rinpoche in Nubri, Nepal. 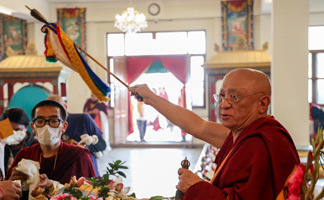 Chokyi Nyima Rinpoche and monks of Ka-Nying Shedrub Ling performed an extensive consecration ceremony of the Trikal Buddha thrones at the Thousand Buddha Temple in Lumbini. 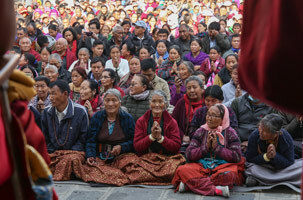 Today, on the final day of the nine day long Ngakso Drubchen, our rinpoches, lamas and monks distributed the accumulated blessings of the entire group practice to a large assembly of devotees. 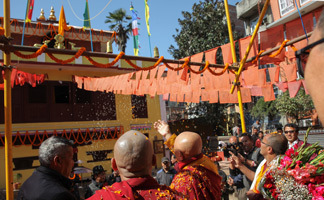 Chokyi Nyima Rinpoche visited Pal Thegchen Ling Gompa in Patan, Kathmandu, where monks of Ka-Nying Shedrub Ling and nuns of Nagi Gompa have just concluded reciting the Buddhas collected words. The annual 9-day Tsekar Drubchen (White Amitayus’─the Buddha of Longevity) performed in Ka-Nying Shedrub Ling Monastery’s main temple concluded yesterday. 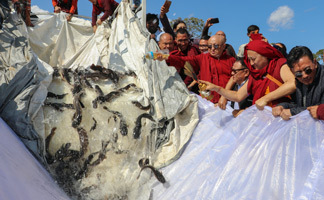 Today, Chokyi Nyima Rinpoche and the monks of Ka-Nying Shedrub Ling Monastery performed a life release ritual at the banks of the Gandak river. May we all succeed in an intelligent mind and a warm heart, especially for the new year of the Earth Pig! 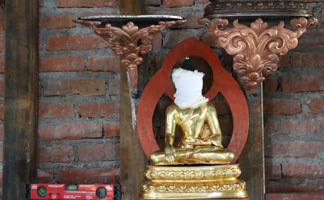 The highlight of the Gutor Puja is the all-day Lama Dancing, or cham (Tib). 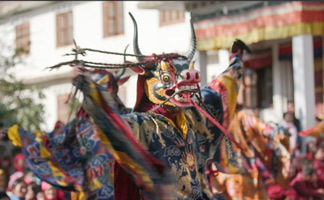 Every year, a large crowd of spectators fill the courtyards to enjoy the monastery’s popular annual Lama Dance. Chokyi Nyima Rinpoche and Tulku Urgyen Yangsi Rinpoche led a full day of Chod practice in Nagi Gompa's main shrine hall. 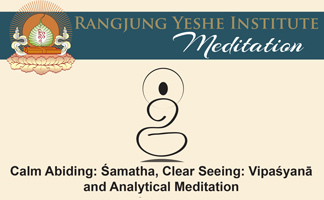 Join us for weekly meditation and guidance on cultivating a stable mind. Everyone, is welcome to join this open meditation class.